After the first date sold out, Laura J Butler – described as simply the most authentic and best Amy Winehouse Tribute available today – offered to perform for a second night, and tickets are selling fast. Next month The Nightingale Hotel in Shanklin will be hosting not one, but two charity events. When the Amy Winehouse Tribute Charity Fundraising Night (all takings going to Shanklin charities) being held on 16th March sold out, Laura J Butler – described as simply the most authentic and best Amy Winehouse Tribute available today – offered to perform for a second night, Friday 15th March. 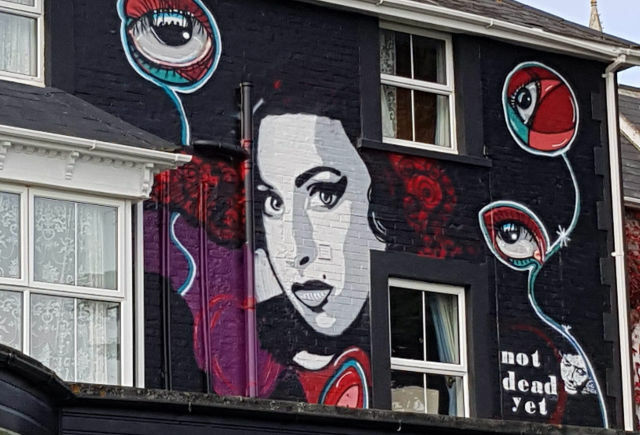 Reader may remember that a huge mural of Amy Winehouse adourns the Nightingale Hotel, created by Isle of Wight artist, Tony Trowbridge. Tickets for the event on the 15th available at £10 each, and once again, Dino at the Nightingale has kindly offered all takings from the night. Monies raised will go to a cause backed by Laura and Amy’s mother, Janis Winehouse, to help Bryony Fry – a strong supporter of the Amy Winehouse Foundation – get her life back on track (you can read more about Bryony’s struggle here). Janis herself will also be coming over to the Island for the event and as you might imagine, tickets for the second date are selling fast. To secure your seat head over to the Facebook event page or call the Nightingale Hotel on (01983) 862742.